I'll explain the blog title later on, but it is going take a bit to get there. Because this is a tough show to review. It is also the most passionate and dramatic performance on the Seattle REP stage this year (and this year included Of Mice and Men). First off, Mike Daisey is my favorite monologist (why yes, there is competition). I first caught him doing 21 Dog Years: Doing Time @ Amazon.com, a show about his experiences at the online giant, and have made it a point to catch him ever since, which has gotten me to the bulk of his other shows (including three out of the four of his Great Men series he did up on Cap Hill). 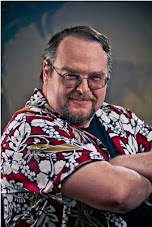 Mike Daisey is the spokeman of Generation Geek. Heavy-set, sweating, with a delivery style that echoes Sam Kinison and John Goodman, armed with a neatly-folded kerchief to dab his forehead and a glass of water, seated at a table, notes in front of him, he talks. He tells a story. He embodies his story and he makes it your story as well. He's very good at that. And Mike Daisey's story is about technology - the cult of Apple and Steve Jobs. And he is telling two stories, from two different ends of the supply chain. The first story is the history of Apple (in general) and Steve Jobs (in particular) and how Apple almost collapsed and then returned in iGlory, and very much about our consumer mindspace about the new shiny item on the shelves and how we take a Gollum-like possessiveness to it all. We don't think about the way the paradigm has shifted (example - Who owns the song on your iPod?) and how the future has changed. And here Daisey is riding the crest of the wave in a friendly audience of tech geeks and Seattle Rep regulars, who know the stories of tech support and have read their Bill Gibson and turned off a plethora of phones before the show started (One of the audience, before the show began, was taking multiple pictures with his iPhone of the nearly-bare stage, to be stitched together later on his computer). Daisey does this well - he comes from out of the tech trenches. We understand and laugh. The second story is about someplace we haven't been. It starts in the cyberpunk Disneyland of Kowloon, and descends into Shenzhen, an instant metropolis larger than New York City, and its Special Economic Zone. The Special Economic Zone is a fief of huge Foxconn factories where all of our high tech toys are assembled by hand by workers reduced to component parts.It is a Kafka-esque domain that combines the worst features of communism and corporatism to produce a gulag of lives monitored, regulated, and burned out. And by burned out I'm not talking about that Friday afternoon when you stare at the screen and you're looking forward to the weekend. I'm talking the burned out that happens when you have to do the same task repeatedly, standing for up to 18 hours a day to make a quota until your spine fuses, and at the first sign that you are unable to do so, you are tossed out. Or, in the case of Foxconn, you jump off the roof of the four story factory because it is easier than living (Foxconn's solution to this fatal disobedience? Install nets on the roofs). These, then, are the true slaves to our machines. Daisey weaves the two stories back and forth, and the second tale soon takes precedence over the relative comfort of the first, as we get the stories, as we get his story of getting those stories that come out of the Special Economic Zone. And it creeps up you, that fact that everything has a price, and forces you to recognize that price and who is paying it. So should I be consumed by recognition? Confronted by it, yes, but not consumed. You see, a while back I had to come to terms with my carnivorous lifestyle (or rather the carnivorous portion of my omnivorous lifestyle). I eat meat. To be more clear, I consume the muscle tissue and flesh of living things slaughtered expressly for that purpose. That recognition, and the pain that the animals suffer in life and on that trip to my dinner table, is enough to make a lot of good people swear off meat entirely. Good for them. I instead choose to reduce but not eliminate, to seek out more cruelty-free options when available, and recognize and honor the animals whose lives my life has ended. (I owe this analogy in part, by the way, to the fact that the REP was staging an "iBBQ" the evening of our attendance. I did not partake, but saw the irony). Similarly, here, People are suffering under inhuman conditions for my toys. Not just for the computers and iStuff. When I was working for WizKids, I was very aware where those plastic, pre-painted miniatures came from. The disks that install the computer games I've worked on were not created by pixies. The Port of Seattle's largest importer for many years has been Hasbro. There is a price, and we must both be willing to face up to that there is a price (not talking dollars, here) and to work to improve the lives of those who pay that price. And it is not just China here. It was Korea and India before that and Japan before that and Mexico and the American South before that and the Triangle Shirtwaist Factory before that. The delivery chain has gotten longer, and the people who are paying for this are further away. No one you know. But they are still there and if we can simply get people to be as concerned about their well-being as we would be about free-range beef and cruelty-free veal, then we've made a needed step forward. Which, I think, is the place where Daisey is going to. The audience was shaken. We had sat down as geeks, listening to Jonathan Coulton sing "Welcome to my Secret Lair on Skullcrusher Mountain" and got up a little more humbled, a little more chastened, a little more aware, as theater volunteers passed out lists of action points as we quietly exited (Item one - drop Steve Jobs a line). We had come expecting Martin Luther to tear the Catholic church a new one and ended up finding our own sins examined. This is Mike Daisey's most political monologue, and his darkest. He opened a door that most would not even think of as a door, and found what was beyond it. He has rattled a few cages, and in doing do, has wrapped up one of the strongest Seattle REP seasons in years. And excuse me, I have to write to Steve Jobs, now.